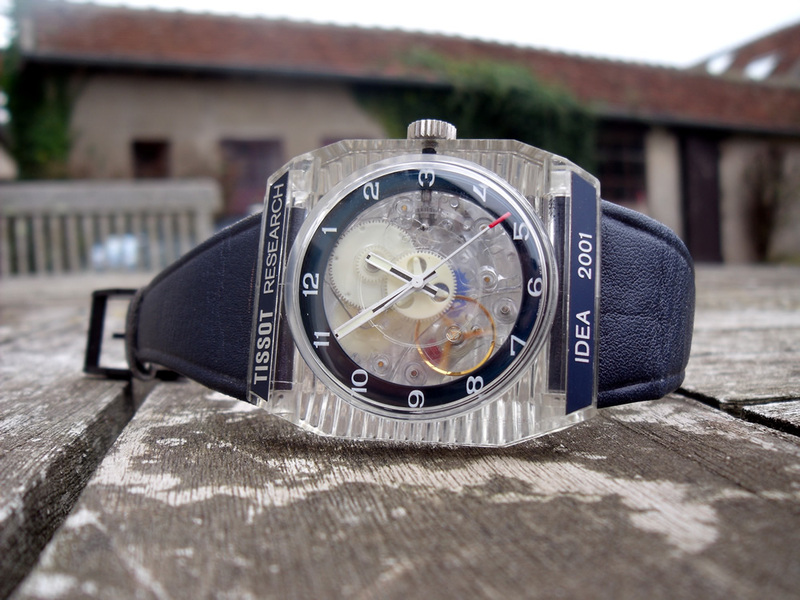 The IDEA 2001 launched in 1971 , the research into a plastic watch started in the early 50's. Twenty years earlier Tissot and Omega had joined to form SSIH (Society Swiss Industry Horologere ) and Tissot assumed the lesser role to Omega. Tissot continued to be innovative and was one of the first to launch and market the antimagnetique watch. 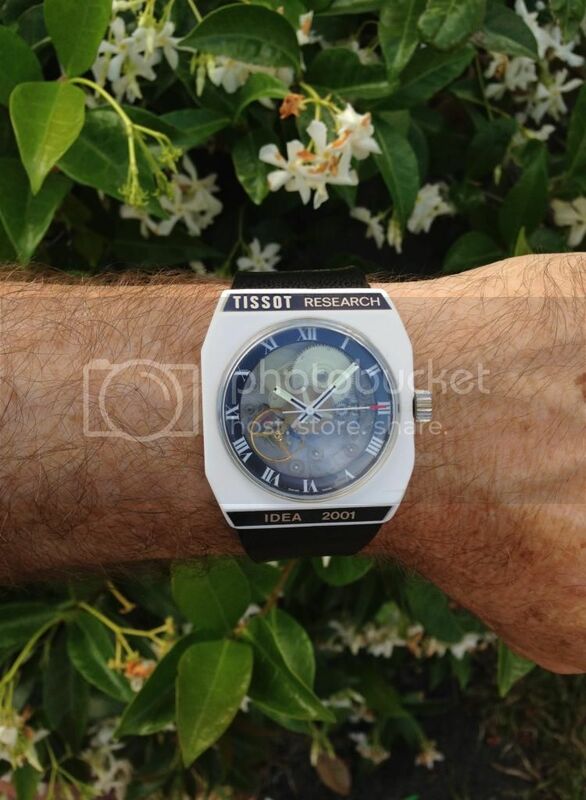 The innovation at the heart of Tissot continued with the Tissot Research IDEA 2001 plastic watch. The watch is very light as you would expect and it's plastic fantastic construction means it doesn't retain any gravitas. It could easily be lost amongst a box of plastic watches at the local thrift store , and consider it some clown watch but that would be a disservice to the 118 years of Tissot watchmaking behind this movement. 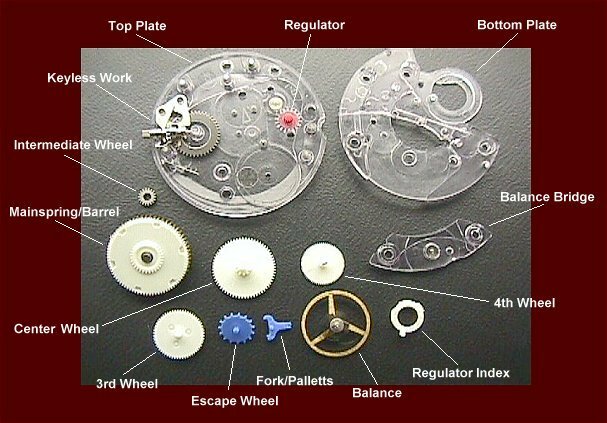 Most of the movement is made of plastic and is designed to be self lubricating, calibre 2250 was named Autolub but was also known as Astrolon and Sytal. The only metal parts are the keyless works , balance and mainspring barrel. As a Skeleton wristwatch Tissot cleverly reversed the normal layout allowing the balance to be seen through the dial. Tissot also developed their own shockproof system and lessened the parts from 91 for the average watch to 52 with some parts of the construction automated. Perhaps not everyone's cup of tea, some people would look aghast at this watch; It's not something they want to see - the equivalent of walking in on your parents! But I ask you to humour me. Lets look a little closer at this piece because I think there is more to this than meets the eye. Sealed hermetically the idea behind the IDEA was to have a mechanical watch that was cheap to make needed no servicing and was an affordable option for the customer. The early 70's was a heady time for Swiss watchmaking and the industry was about to undergo some radical changes. The Neuchatel Observatory chronometer trials had just closed. The first auto chrono wristwatches had emerged. Pulsar had plans to launch their LED in the spring of 72 and LCD was on its way. At the onset of the quartz revolution Tissot must have hoped they had a winner with this funky affordable Swiss timepiece but history tells us it failed. The quartz juggernaut rolled over the Swiss industry leaving a trail of destruction, so much so that a mere 7 years later SSIH was in deep financial trouble. ASUAG ( Allgemeine Schweizerische Uhrenindustrie AG ) was also facing liquidation. ASUAG was the worlds largest movement maker and parent company to GWC, General watch company. Desperate bankers forced both companies to merge in 1983 to form SMH. In 1985 Nicolas Hayek the executive that oversaw the merger made the company private along with Swiss bankers and private investors. The initial restructuring coincided with the launch of the Swatch watch. The Swiss watch or Second watch. Elmor Mock and Jacques Muller are credited with designing the Swatch. Muller said he was inspired in 1980 while lying on a beach. The goal was to whittle down the average number of quartz parts from 120 to 51 and to automate the manufacture. The result was a watch in plastic that had colour and novelty and every 6 months a new range could be released. Launched in 1983 the designers hoped they had a winner with a funky affordable Swiss timepiece and history tells us it was a smash hit. In 1998 the company became the Swatch group, seems this little plastic watch was so successful the company rebranded itself after the product.
" Switzerland was a misery 30-35 years ago...thanks to Swatch all brands exist"
Its not often that ideas arrive fully formed. Usually there is a progression. One incremental step leading to another . It is not impossible to imagine that the early Swatch designers might have delved into their own company back catalogue to mine information from the IDEA to help develop Swatch. So then if Swatch was the counterrevolution to stop the Quartz revolution then it might be likely that the IDEA was the seed of that counterrevolution ? 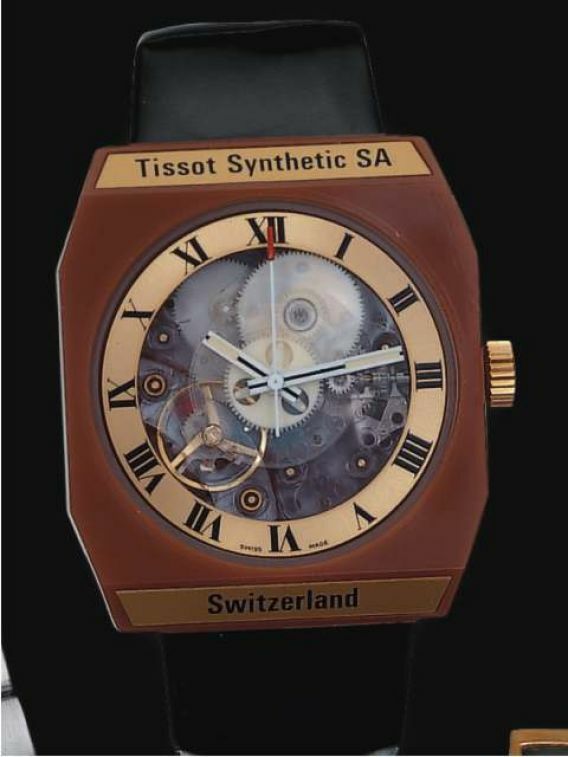 The Swatch group have never publically linked Swatch to the Tissot plastic watch that I could find. Despite its throwaway origins the movement is still smooth and easy to set and wind and keeping excellent time. Like Swatch it came in a range of colours. Arguably with this watch it may have been a case of too much to early. After all back in the 70's our TV cabinets where still constructed with timber and plastic was still cheap and nasty. By the time the 80's rolled around things had changed. We carried coloured plastic Walkman on our belts. Colour went bright, big hair, crimped, combed over to the side and spandex pants...and you should have seen what the girls wore. Swatch was part of the Zeitgeist and marketing managers had started to hone their craft. I don't want to elevate this watch to a lofty status beyond its original intention : an affordable Swiss mechanical watch designed to be a disposable but I do think this watch deserves its place in the history of the wristwatch, at least so thought George Daniels as he reportedly had one in his collection. Last edited by James A; December 19th, 2014 at 21:07.
bobbee, pinkybrain, ec8_civic and 16 others like this. I would love one of these, as you say this watch is seminal in the development of Swatch, I believe. These watches definitely deserve their place in horological history and I'm still on the look out for a nice working example for my collection.
" I can't wear this uniform, without some compromises "
"I larf, I Larf, I wee I pants, I make I leg go rusty." You learn something new every day. Very nice James and thanks for sharing. It so much is like the Swatch System 51,actually System 51 so much like this Autolab ( without knowing technical differences ). Nice milestones in horlogerie and nice find.So futuristic in design and components, Tissot is really another desired brand with all what a collector may wish, innovation,heritage,manufacture and available information.Lucky you. There's an interesting tear down and analysis of the Sistem 51 on Christian Dannemann's Watch Guy blog. Pretty dismissive, in short. Thanks, James for the write up on the Tissot. 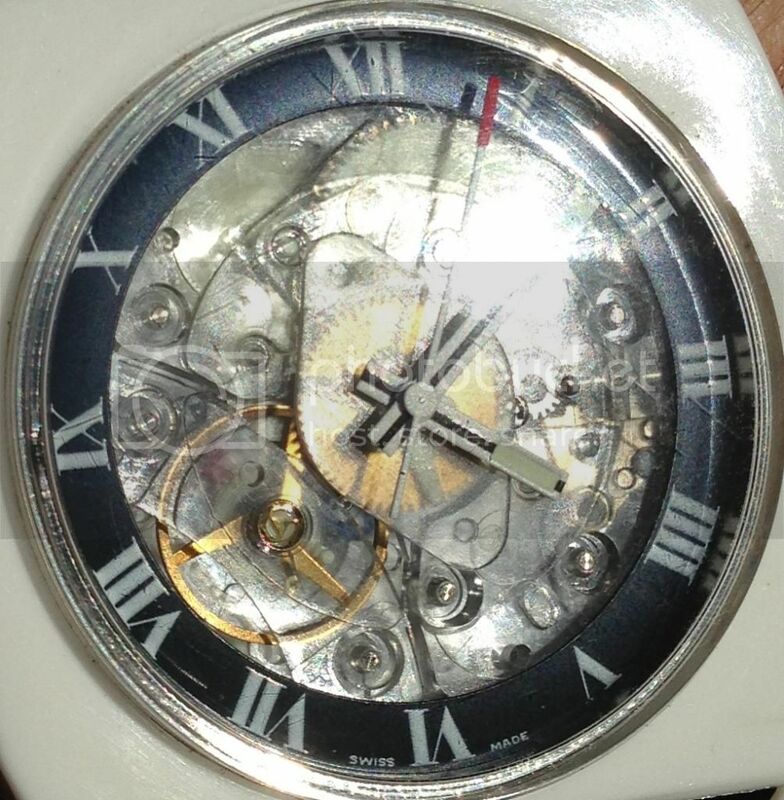 I once read that the problem with that watch was that you couldn't get around the fact that it was still mechanical and therefore still driven by a mainspring. The power from that spring on the geartrain exerts a lateral force so that the gears are pushed sideways in their jewel bearings. This is perfectly OK when you have jewels and metal pivots but it is more likely to wear out the pivots if these are plastic, even when thick enough and sitting in plastic bearings. The success of Swatch, in many ways the same sort of watch with a quartz instead of mechanical movement, was due to the fact that quartz watches have an indirectly driven geartrain so that these strong forces are eliminated. James A, busmatt and Apollonaught like this. Names like System 51 and Idea 2001 are no accidents. Tissot started the Astrolon adventure already in 1951, and 2001 would have been the 50th anniversary. 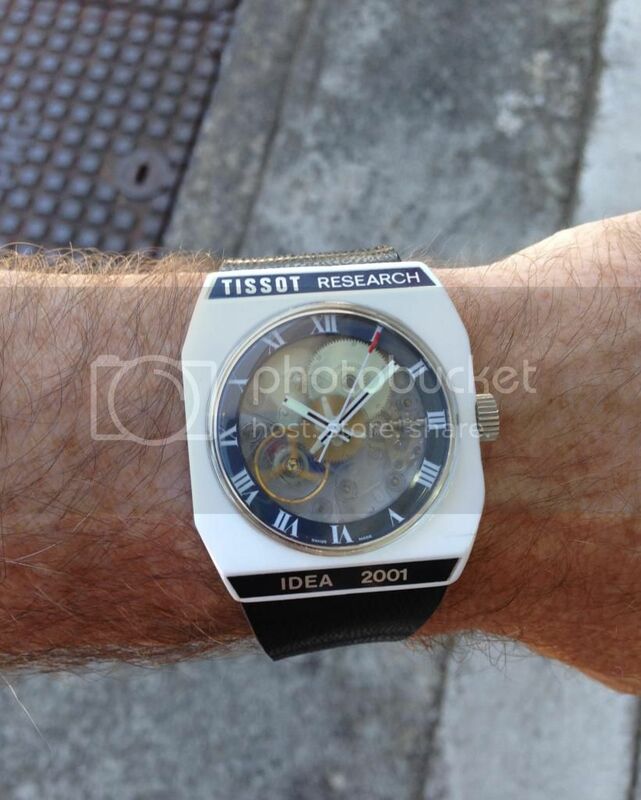 bidfun-db Archive: Wrist Watches: 623: Gents Tissot Reseach Idea 2001, plastic movement, ca. 1975 n.o.s. James A, busmatt and Emre like this.